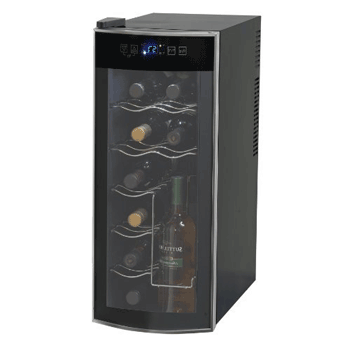 This 36-Bottle EdgeStar Built-in Wine Refrigerator review is aimed at wine enthusiasts who are currently on the market for a unit that is reliable and would make a good fit for their kitchen, home bar, man-cave, and just about any other interior space fit for a wine cooler. This feature-filled unit is one which simply cannot be ignored, especially if you’re looking for as much visual appeal as great functionality. 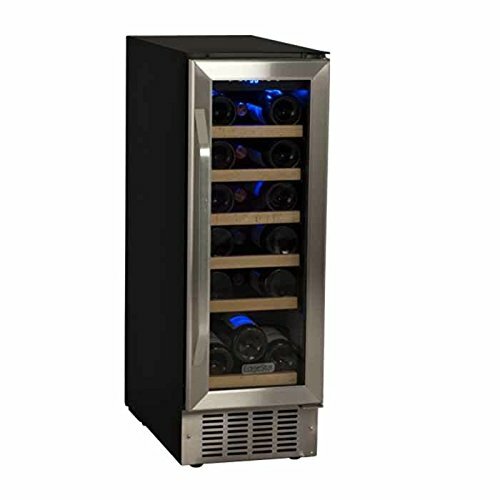 With regards to the design, everything about this EdgeStar wine fridge embodies class, elegance and sophistication. That’s exactly what any interior you’d house it in will get, a focal point of classy elegance. Wooden shelves (and the bottles you’ll subsequently store) are illuminated by a blue LED internal light, which is balanced out by the digital LED display, which is also blue in color. The doors are trimmed with stainless steel, each finished off beautifully with a fine towel-bar door handle. 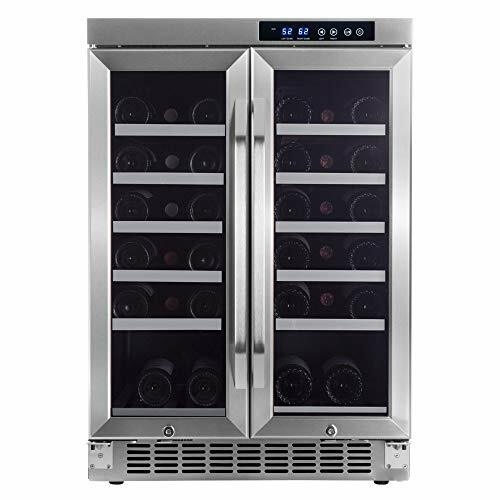 This wine fridge makes use of dual-temperatures zone operation in its most effective way. Each temperature cooling zone is independently accessed via its own glass-door. A digitized thermostat and its associated soft-touch control unit make it easy to operate and it also features a tinted glass door which offers effective protection from harmful external light rays. A dozen wooden shelves slide out easily for quick access and the 36 standard wine bottle capacity takes up a volume of only 34” (H) x 23.5” (W) x 22.5” (D). The unit weighs 110 pounds and offers flexible installation/placement options either as a freestanding unit or a built-in/under-counter wine refrigerator. A one year warranty covers what is an overall robustly built wine refrigerator, with parts that are easily replaceable for a prolonged product lifespan. As far as the functionality of this wine refrigerator goes, it’s a classic case of getting exactly what you pay for, which in this instance is meant in the best way possible. We are all for two separate and completely independent cooling compartments which even have their own separate doors. It doesn’t get much better than that as far as efficiency goes because you’re never at risk of “exposing” wines in one compartment to the outside air while trying to access the other compartment. The French-Door design effectively makes this a two-in-one wine refrigerator, so it’s like you have two wine coolers side-by-side. Both compartments’ temperatures have a wide range of between 40 and 60 degrees Fahrenheit, which gives you total freedom to decide where and how to store all wine varieties you may have. No uneven temperature zones, as made sure of by the internal air-circulation fans. You won’t even have any reservations about mixing your chilling selection up with some corked and re-corked bottles. This is made sure of by the internal air neutralization carbon filters, which are built into the fridge and go about their thankless task of keeping wines fresh and uncontaminated. The temperature is easy to keep an eye on and tweak with the digital control unit (soft-touch) and the digital display unit. Very responsive to user inputs and holds set temperatures quite well, with negligible ambient-temperature reliance. As far as the permutations of storing different wines go, this is outright the best wine refrigerator. Setting both compartments to an in-between temperature of around 56 degrees would be a serious waste of its power, even though this would work to store both reds and whites anywhere you’d want. You’d be better served to use one compartment exclusively to chill reds and the other to store whites because this would mean you could store them at their optimal temperatures, keeping them ready for hassle-free decanting. The very first thought that jumps into one’s mind when looking at this cooler is nothing less than refined quality. Most of this wine refrigerator’s elegance is perhaps drawn directly from its French-door build, which has implications that go beyond physical appearance. This cooler operates very competently although it’s not without its small drawbacks (perhaps like every other wine cooler ever made). The biggest takeaway from our completion of this 36-bottle EdgeStar Built-In Wine Refrigerator review is indeed that while you would comparatively pay more for this unit, every cent you pay has about double its value in performance. You’d be hard-pressed to find better value for money, something which has become synonymous with the EdgeStar name in general. The bottom line is 36 of your favorite bottles will be competently chilled to perfection.